Everything was wonderful, thank you both so much. 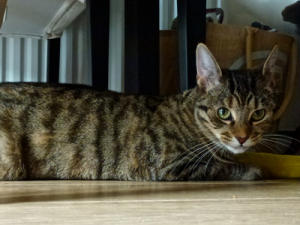 I was a little freaked out as it was the first time I had left her for longer than 24 hours but she was absolutely fine, I particularly liked the photo updates – my sister uses another cat sitter as she lives in shepherds bush and I know she was jealous! As you know i have only had Maggie a couple of months and she is not the most relaxed of cats (!) but before I went away she was making leaps and bounds and I was worried that leaving her alone for so long would mean we went back a few steps but she is absolutely fine and sat on my lap for an hour purring away when i got back which was a first!! I have been reluctant to go away and have wriggled out of invitations for the last 3 months but now I know I can go and she will be in safe hands.